When you sign up to be a baddie in a Hollywood movie you pretty much know you're buying a one way ticket to Doomsville. Star Wars is no exception. Whether you are on the big ol' Death Star when it goes 'Ka-Blooey' or sadly turning back to the side of good with your dying breath to save your son (resists gagging reflex), you'd think the least the Empire could do is put on a bit of a spread to say 'Thanks for all your villainous work'. Full range of photos up online here (definitely click this link people - Robin's photos are insane), and via Geekleelist. aw yeah this is why i love your blog Dan! i'm so glad i got here first for this posting. 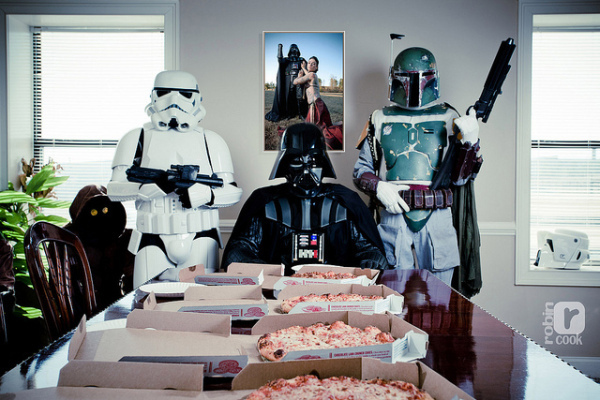 this whole idea of the scene in ESB where Vader is at the end of the banquet table with pizzas on it when Han and party arrive is freaking brilliant! and this model doing the Princess Leia slave girl pose is pretty hot too! i dunno for some reason the tattoos really work for me with this out fit. i wonder if she has a tattoo on her lower back too? Craig, where the Hell is my wing man? I'm coming. Hang on. How sweet is that? The tattoos work for me too. Complete the whole ensemble. Alan just posted this video on Facebook. Not nearly as hot as this one, but funny as hell. And it ties in Star Wars promotions with the whole "kids in capes" theme from earlier. THAT WAS AN AWESOME COMMERCIAL CRAIG! everybody check it out if it doesn't give you a laugh then you need to check to see if you have a pulse. by the way Craig i saw your latest posting on Derosby Bros. and i'm going to send you something i think you'll like given your interest in collectible drinking glasses ans Star Wars. i just need to give the batteries for my digital camera some time to charge. Cheers for that guys - that commercial was brilliant Craig - showed the folks in my office too! The whole series of photos is sweet so be sure to check them out guys!